My next book, Headlines from the Holy Land: Reporting the Israeli-Palestinian conflict, will be published in September. My thanks goes to those journalists and academics who have read the manuscript. You can read their endorsements here, on the publisher’s website. Please either post a comment on this site, or email me at reportingconflict@hotmail.com, if you have any questions about the book. I will be posting more details about it between now and publication. My next book, Headlines from the Holy Land, is due to be published in September. A brief description follows, and you can read more on the website of the publisher, Palgrave MacMillan, here . Tied by history, politics, and faith to all corners of the globe, the Israeli-Palestinian conflict fascinates and infuriates people across the world. 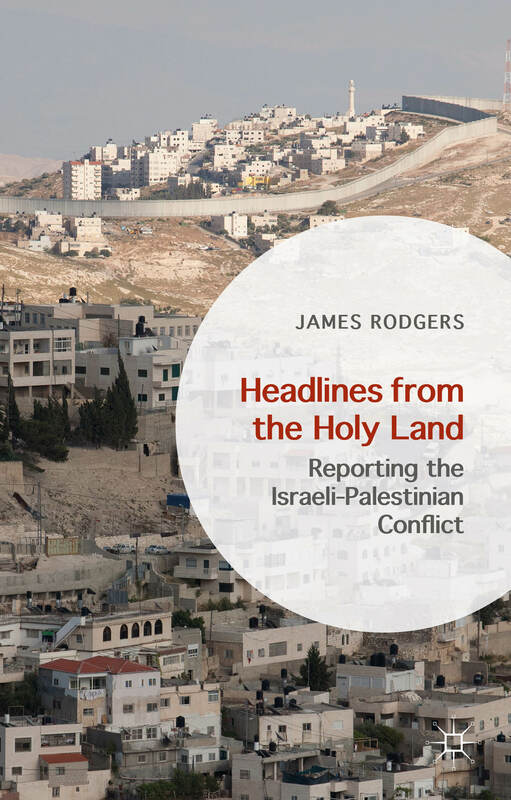 Based on new archive research and original interviews with leading correspondents and diplomats, Headlines from the Holy Land explains why this fiercely contested region exerts such a pull over reporters: those who bring the story to the world. Despite decades of diplomacy, a just and lasting end to the conflict remains as difficult as ever to achieve. Inspired by the author’s own experience as the BBC’s correspondent in Gaza from 2002-2004, and subsequent research, this book draws on the insight of those who have spent years observing the Israeli-Palestinian conflict. Starting from a historical perspective, it identifies the challenges the conflict presents for contemporary journalism and diplomacy, and suggests new ways of approaching them. I will be publishing more details about the book, and events connected to its launch, on this site in the next few weeks. In the meantime, if you have any questions, please post them here, or email me at reportingconflict@hotmail.com. 1. IT’S DANGEROUS. The number of Palestinian civlian casualties, many of whom could not be considered by any definition combatants, shows that no one is safe. This may be obvious, but I mention it because it’s always useful for interested audiences to consider the circumstances in which reporters are working. At least eight Palestinian journalists have been reported killed during this operation. Other journalists have been killed before. The British cameraman James Miller was shot dead by the Israeli Army in Southern Gaza in 2003. The dangers have consequences for coverage. How can you get Hamas’ side of the story when their leaders are in hiding? Two of the Hamas leaders I used to interview when I was in Gaza from 2002-2004 were subsequently killed by the Israeli military. 2. SOCIAL MEDIA continue to challenge and to complement conventional news reporting. In a region, such as Israel and the occupied Palestinian territories, where you have such widespread internet access and usage, this will continue to be the case. Social media, though, in this case was not always the leveller it is claimed to be. Some of the people I follow on Twitter from Gaza were frustrated by absent electricity. 3. VERBAL ABUSE IS PART OF THE REPORTER’S LOT The Israelis and Palestinians will inevitably use the local and international news media as a parallel, verbal and pictorial, battleground. Shortly after they begin to do so, there follows criticism of the way that journalists are reporting the conflict. It almost seems that media editors simply wait 24 hours (or perhaps 12, or less, in the social media era) then commission someone to write about where their colleagues in international news are getting it wrong. The resulting concerns are amplified and added to by those of experts real, imagined, and self-appointed. Some of these, of course, have rarely, if ever, been to the region at all — and almost certainly not to Gaza. 4. CONTEXT IS KING You have to go back a long way to understand today in the Middle East. 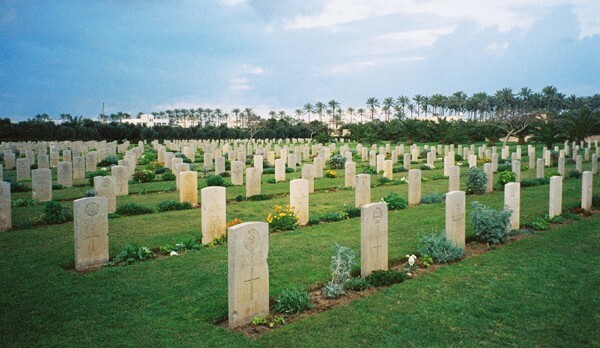 It is no coincidence of history that there are First World War British soldiers’ graves in Gaza. Their presence was part of what made the region the way it is today. If you do not understand that as a reporter, you can be sure your contributors will. Paul Mason of Channel 4 News in the UK was just the latest British journalist to experience this. Shortly after arriving in Gaza in 2002, I was reprimanded by an elderly refugee for coming from the country responsible for the Balfour declaration. Perhaps to the BBC’s credit, the declaration and its significance had been one of the questions at the interview for the post of Gaza correspondent. 5. YOU WILL NEVER GET IT EXACTLY RIGHT However hard a reporter tries when covering this story, journalism has its limits. Its critics see conspiracy or bias where sometimes the tool is simply not adequate to the task. News journalism relates what happened today. In the Middle East, that alone is never enough to explain what is going on. Nevertheless, there are spectacular errors. ABC News’ use of destitute Gazans to illustrate the consequences of rocket fire on Israel was perhaps the worst example. Breathtaking incompetence, or woeful ignorance? Against this, though, there have been countless examples of strong, fact-led, eyewitness reporting from Gaza. Without this, we would have little idea what was going on. No western politician sets foot there these days. The only outsiders who have seen it are medical staff; aid worker; — and journalists. Large-scale bloodshed in the Israeli-Palestinian conflict provokes a series of responses. Often, they seem almost to follow a pattern — especially when, as at present, there is no prospect even of talks about talks to end the conflict. In the absence of any meaningful political process, the two sides fight; Israel’s far superior firepower means more Palestinians than Israelis are killed; eventually, there will be a ceasefire. Alongside the bombs and bullets, the warring parties trade arguments: both for the benefit of their own people, and international consumption. The news media report what’s happening. Lobby groups and columnists criticize the media coverage. Journalists writing about the conflict can expect to receive abusive email (something of which I was reminded yesterday). Yet there is no doubt that in all contemporary wars belligerents place massive emphasis on the importance of their media campaigns. As a Georgian official I spoke to after his country’s 2008 war with Russia told me, ‘In this century, and in a conflict where you have a huge power against a small state, I think that’s almost as important as the media battle.’ (From Reporting Conflict p.68). In the last week, I have had two pieces published on the website of The Conversation. You can read the latest one here (a version follows below, too) and the earlier one (posted last week on this site) here. Among other issues, they consider the challenges of reporting from Gaza, and the way editorial priorities in the Middle East are shifting. The world was no longer watching – at least, that was what both Israelis and Palestinians seemed to feel when I visited Jerusalem and the West Bank late last month. Yet the people on both sides of the conflict suspected what outsiders did not: that things could go badly wrong very soon. Now missiles strike targets in Gaza to stop rockets launching out of there. With a combination of horror and despair, the world is watching. I had been on the West Bank talking to people for my next book: Headlines from the Holy Land. 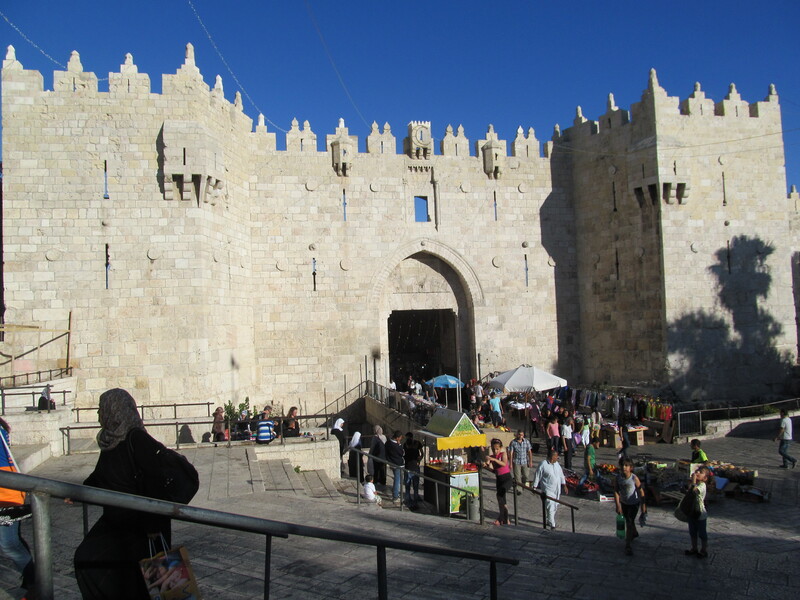 Travelling back to Jerusalem, I wondered if I could step off the bus at the main check point to take pictures of some of the fortifications. When I was based in the region, this might have been something which could get you into trouble – perhaps only shouted at; perhaps warned off with a shot. At the back of my mind was always the death of James Miller, a British cameraman fatally shot by the Israeli Army in Gaza at the time I lived and worked there as the BBC’s correspondent. All the people I asked whether it was safe or wise to take photos at the Qalandiya checkpoint dismissed my concerns. One Palestinian journalist even told me it had become “like a TV studio” there. I jumped off the bus, took my pictures, and got on the next bus back to East Jerusalem. A week later that side of the city was no longer as calm. Palestinians, angered at the abduction and killing of a Palestinian teenager, clashed with Israeli Security forces. That abduction was apparently carried out in response to the earlier killing of three Israeli teenagers. At the time of my visit, the three Israelis had been missing for ten days, but their deaths were yet to be confirmed. The atmosphere I experienced – where you could pass checkpoints without hindrance, and photograph the concrete wall next to them – was deceptive. Two weeks later, the Israeli-Palestinian conflict has reached a level of violence not seen since Israel’s last major offensive on Gaza, in November 2012. Then, as now, Israel says its operation is aimed at stopping rockets being launched at Israeli targets. Now, as then – given the density of population in the besieged coastal territory – the majority of the dead are civilians. That’s more like the Gaza I knew when I lived there from 2002-2004, at the height of the second intifada, or Palestinian uprising against Israel. Perhaps because of my previous experience, I too feared the worse when I read of the disappearance of the Israeli teenagers. There seemed a strong chance their deaths, if such they were, would not be the last. Israelis I spoke to on my first morning in Jerusalem asked if the story was being covered in the UK. I explained that Iraq and Syria were dominating the British headlines from the region. They were dominating news-gathering agendas, too. For while the calm I experienced crossing into the West Bank two weeks ago may have been temporary, something else had changed since the second intifada: the number of international journalists based in Jerusalem. It had fallen significantly. Many US news organisations had left – driven away by dwindling budgets, drawn away by more dramatic events elsewhere in the Middle East. Rumour suggested some big British names were planning to follow suit. 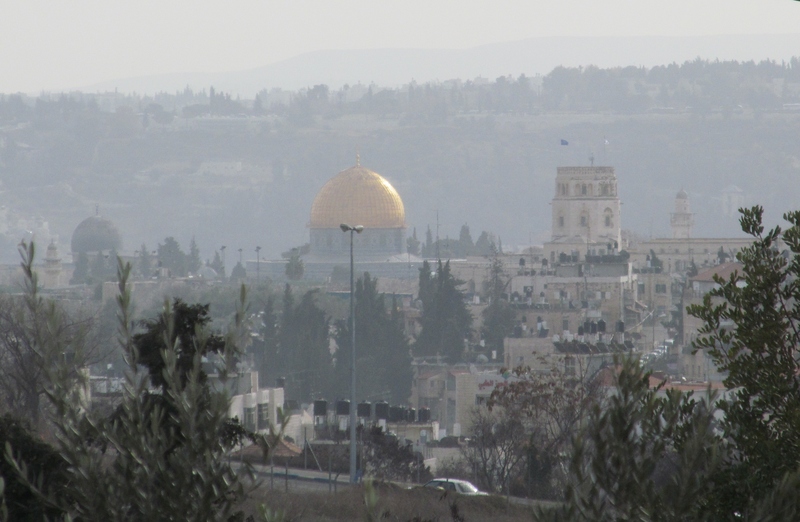 Would it matter if Jerusalem ceased to be the journalistic hub it has been in recent decades? There are good reasons for going elsewhere – not least that Israel’s relations with some of its neighbours make it a poor departure point for travel in the wider Middle East. My own experience with my camera that afternoon taught me a valuable lesson. My concern that taking pictures might land me in trouble was based on my experiences of a decade ago. Reporters working there more recently knew I was not really taking a risk. Yet if things had changed, it was only on the surface. The bloodshed in Gaza of recent days shows that the previous quiet did not mean peace. That leads me to another reason why reporting from Jerusalem is so valuable. Palestinians and Israelis have little direct contact. In that part of the world, international journalists are among the few who can travel widely, including to Gaza. Even diplomats, divided as they are between missions to Israel and the Palestinian Authority, rarely get the full picture. Those from the EU and the US are not even permitted to talk to Hamas), which has been in charge of Gaza for the best part of a decade. They may instead seek journalists’ views. So reporting from Jerusalem, whatever its shortcomings, is an invaluable resource for understanding the region. Diplomacy, in the shape of the latest failed talks, has ground once more to a halt. News organisations should reflect that no peace process should not mean no correspondent. As I work on my next book, ‘Headlines from the Holy Land’, the place where I spent two years as a correspondent, the Gaza Strip, is a war zone. This week, The Conversation published an article I wrote based partly on my recent trip to Jerusalem and the West Bank to carry out research for the book. You can read that piece here, and a version follows below. THE SCORCH MARKS AND ANGRY GRAFFITI seemed familiar. The rubbish underfoot in the dust on the hard summer ground did, too. The calm suggested that something had changed. That impression grew. The officer from the Israeli border police took only a quick glance at my passport, pressed against the glass behind which she stood. At the Qalandia checkpoint on the West Bank between Ramallah and Jerusalem, nearby fortifications were built of tall concrete slabs and fire had blackened one of the watchtowers. 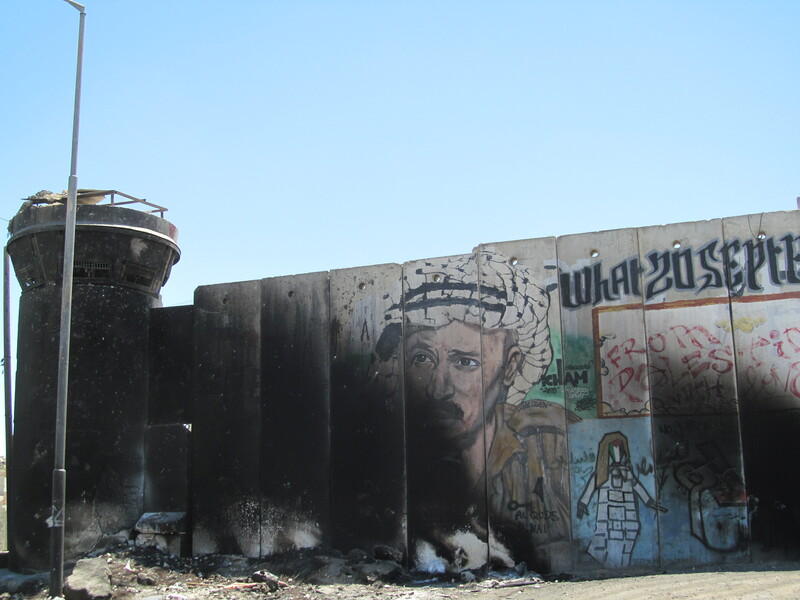 The flames had even disfigured part of the wall’s defiant decoration: a spray-paint portrait of the late Palestinian leader, Yasser Arafat. I was coming back last week from doing interviews for a book: “Headlines from the Holy Land” which I am writing, about journalism and the Israeli-Palestinian conflict. My own interest stems from the two years, 2002-2004, I spent as the BBC’s correspondent in the Gaza Strip. The signs of violence and conflict that day reminded me of the countless times I crossed from Israel into Gaza, sometimes even as Israeli warplanes tore overhead on their way to hit targets in the crowded coastal territory. The calm which seemed so striking a couple of weeks ago was, of course, deceptive – as violent conflict has erupted once again in the Gaza strip. Qalandia is not at the heart of the latest fighting, but it was incidents on the West Bank and in East Jerusalem – the beginning and end of my journey that day – which provided the spark. In June, three Israeli teenagers were killed on the West Bank, which, along with Gaza, Israel occupied in a war with its Arab neighbours in 1967. The killing of a Palestinian teenager from East Jerusalem followed, apparently in revenge. Now Israel and Hamas, the Palestinian Islamist movement which controls the Gaza Strip, are engaged in their most serious military confrontation for almost two years. Reporting from Gaza can be fascinating, frustrating, heartbreaking, and, sometimes, rewarding. It can also be difficult and dangerous. Pressures of deadlines, and the importance of accuracy – where you will never satisfy all members of your audience that you have been accurate – make it all the more demanding. Deciding to take the wrong turning at the wrong moment can put you in serious trouble, or worse. That is just for the international journalists. Palestinian colleagues must also worry about their own families and property. At this particular time, almost all of them will also be observing a strict dawn-to-dusk fast for the Muslim holy month of Ramadan. Telling the story is a real challenge. For even sticking to the basics prized by most news organisations in the English-speaking world: “who-what-when-where-why-how” presents endless dilemmas. The “why” in particular is a question with endless possible answers. My recent research has led me to look at the work of my predecessors as correspondents in the region. The late British Conservative politician, Winston S Churchill (grandson of the wartime leader) was among them. He reported on the 1967 war. The book “Six Days”, which he co-wrote with his father, Randolph, takes the reader as far back as the Bible as a way of providing introductory context. You do not need to go back quite that far to see the immediate causes of the current fighting. There is a grim familiarity about Israeli statements about “striking the terrorist infrastructure” (given Gaza’s dense population, this often involves killing civilians too) and Hamas’ threatening to “open the gates of hell”. Having locked horns, both Israel and Hamas will have to strike at each other until they can separately claim victory. Past experience – and Israel’s “Iron Dome” missile defence system – suggest that ,many more Palestinians than Israelis will be killed before that point is reached. 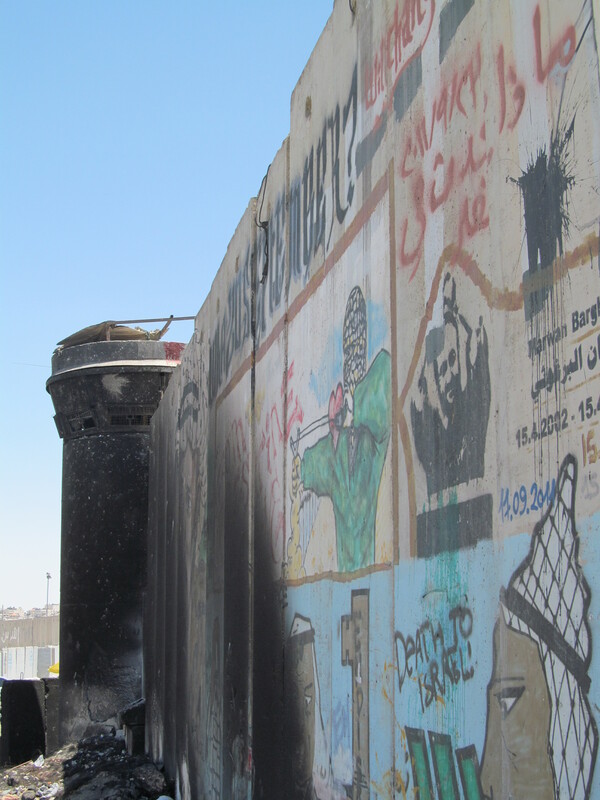 I was surprised by the calm at Qalandia that day, but not deceived. In the Israeli-Palestinian conflict, such moments – even if they last for months – are born of fatigue and resignation, not reconciliation. Has anything really changed since I was in Gaza and Jerusalem a decade ago? Yes: the surrounding region, and not just that. War in Iraq and Syria has led many to conclude that the borders drawn up by colonial powers at the end of the First World War have had their day. Two decades years of talks aimed at defining borders for two states – Israel and Palestine – between the River Jordan and the Mediterranean – have failed, most recently in April. For all it must be hellish now, Gaza could get worse. Two years ago, the United Nations asked whether it would be habitable by 2020. “Operation Protective Edge”, as the Israeli Army has named its latest campaign, will not bring an end to the conflict. Rather, it will serve to remind the world of the problems which plague Palestinians and Israelis – even as neighbouring Iraq and Syria serve as reminders that discontented populations and military occupations, even national borders, may endure for decades, but not always for ever. I have just returned from a trip to Jerusalem and the West Bank to gather material for my next book, ‘Headlines from the Holy Land.’ In the last few days, of course, the conflict between Israel and Hamas has reached an intensity and violence unseen for more than 18 months. This morning, I have published a piece on the website of The Conversation looking at the situaton in the region. I will publish a version of it, together with some more photographs from my recent trip, on this site tomorrow. In the meantime, you can read it here. As the conflict has flared up, so the coverage has increased. The challenge for journalists is to try go give as complete a picture as possible, while accepting that — whatever they write or say — they will inevitably by found wanting by some members of their audience. The other difficulty, as with the reporting of all armed conflict, is to try to judge what the consequences might be. This Israeli operation — like similar large scale ones in Gaza in 2009 and 2012 — will not bring a resolution of the conflict any nearer. Nor is there any clear prospect for diplomatic progress. As Barak Ravid points out in the Israeli daily Haaretz this morning, there is no obvious broker to assist in the agreeing of a ceasfire. At the start of this year, I began work on my next book, ‘Headlines from the Holy Land’. The book is due to be published next year by Palgrave MacMillan. It is the story of the way the Israeli-Palestinian conflict is, and has been, reported — particularly by British and U.S. media. I’ll be publishing more details on this site as the work progresses. For interviews and other research, I travelled in January to Jerusalem and the West Bank. The day before I left, I chanced to see a war memorial in my local church in west London. It revealed a link between where I was going, where I had once reported from, and where I now lived. I wrote the story of what I found for the BBC’s ‘From our own Correspondent’. It was broadcast on Radio 4 in the U.K., and on the BBC World Service, during the last week. You can listen to it here, and a version of the script follows. At this time of year, the grass in the cemetery seems at its greenest – watered not by sprinklers, as in the summer heat, but by winter rain, and, unusually this year, snow. There are more than two-and-a-half thousand headstones. Standing out against the hillside, they rise in rows up a gentle slope. In the distance, through trees and telegraph wires, you can see the domes and spires of the Old City of Jerusalem: the prize which brought to the Holy Land the soldiers who are buried here. When I visited, a team of gardeners were weeding the flower beds which lie at the foot of the gravestones. I was looking for names I had seen in my local church in London the afternoon before my departure. Noticing a wooden cross above a book of remembrance, I had gone for a closer look. The cross turned out to have been carved from wood from the Mount of Olives. 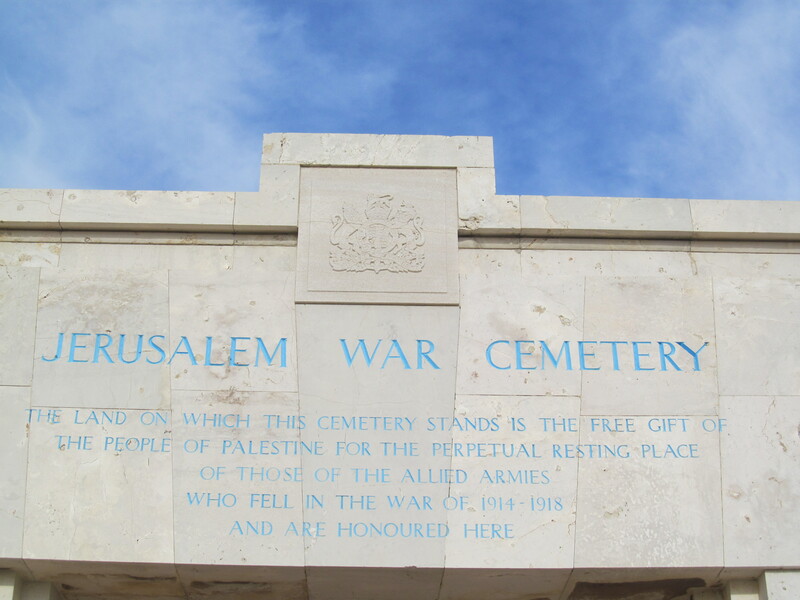 Soldiers from my area had, it seemed, served in Gaza and Jerusalem during the First World War. Having spent two years as the BBC’s correspondent in Gaza a decade ago, the connection fascinated me. So when I returned to the region last week to conduct research for a book, I decided to see if I could find their graves. I wasn’t having much luck. Then someone behind me called out, ‘Hello! Where are you from?’ I turned to see one of the gardeners rising from his work. He introduced himself as Mohammed, and said that he had worked there since 1970. Four decades and more did not seem to have decreased his enthusiasm. His hair was white, and some of his teeth were missing – but his work seemed to invigorate him, and he had a moustache to make a patriarch proud. Had I been to other cemeteries? After I told him I had been to the ones in Gaza, we chatted about the gardener who had tended those for many years, and whom I had met when I reported on his retirement. With Mohammed’s help, I was pointed in the direction of the graves of some of the men from my local parish. They had been killed a few days before Christmas 1917, as British forces sought to consolidate their hold on Jerusalem. Their occupation of the Holy Land then was part of the process – the defeat and dismantling of the Ottoman Empire – which would see the Middle East divided by borders we largely recognize today. 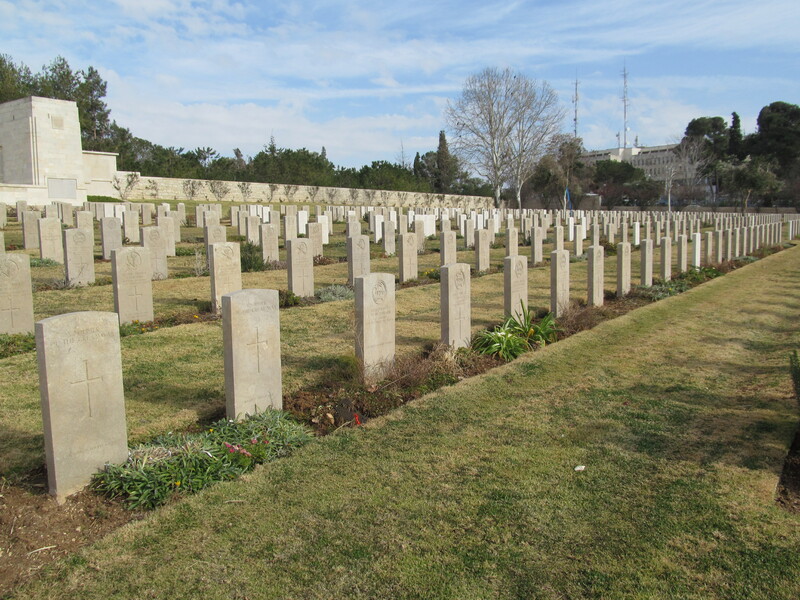 British forces stayed in Jerusalem until 1948. Their commanders came to use the King David Hotel, opened in the early 1930s, as their Head Quarters. This made the building a target for Jewish fighters seeking to drive them out of Palestine. In July 1946, bombers disguised as milkmen blew up the southern wing of the hotel, killing 91 people. Today the King David hosts Presidents and Prime Ministers. Guests in sitting the lobby on my recent visit seemed casually dressed, but snatches of conversation, and ubiquitous smartphones and tablet computers, suggested they were doing big business. It is not a place for the budget backpacker to the Middle East. I had come to learn more about the experience of my journalist counterparts in the late 1940s. Some of them had narrow escapes from the explosion. ‘It was here,’ explained Maya Morav, the hotel’s PR Manager, flicking on the lights to a basement room. ‘Now it’s a hall for conferences and meetings.’ Then it had been a subterranean kitchen: the place where the bombers left the milk churns they had packed with explosives. Less than two years later, the British Mandate came to an end. British involvement in the Middle East, of course, did not. When you are covering the Israeli-Palestinian conflict as a correspondent, you need to have history at your fingertips: often, more than one version of it. One of my earliest experiences in Gaza was being welcomed, and then chastised, by an elderly Palestinian refugee. Because I was British, he saw me as bearing some of the blame for events of the previous century which had left his family in a shanty town in one of the most crowded parts of the world. Perhaps he had a point. As events remembering the First World War begin this year in Europe, perhaps the real focus should be on the Middle East, where decisions taken then helped to shape Jerusalem, Gaza, Israel, Syria, and Iraq as they are today.